Ama Dablam Summit push is ON! Whilst it isn’t the most comfortable camping spot in the world, the fact that the sun crests over the mountain and hits the tents at 6.15 AM is a huge bonus particularly when everything seems to freeze solidly overnight and getting out of the deep, dark depths of a sleeping bag to embrace the day - or rather, embrace the jumar - is made somewhat more lucrative and less baltic. At 7am our 2-day summit push officially began as Sergey, Valdis, Chad and I left the warmth of our yellow tents and began the steep climb to Camp 2.7 - an ascent of about 300 vertical meters over technical terrain of rock, ice and exposed ridges. The allusive snow-capped summit of Ama Dablam seemed to appear closer and closer with each precarious step. It was a gorgeous day with blue skies and a very light breeze so we managed to stay warm in the sunshine and top up our raccoon-eye tans. We’d already climbed from Camp 1 – Camp 2 as part of a training rotation so the familiarity of the terrain and the ropes certainly helped to ease nerves over some particularly exposed areas which had previously made my stomach turn and my heart beat double-time..! Just before Camp 2 we were met by the infamous 12m vertical rock wall better known as the Yellow Tower. If climbing Ama Dablam was a video-game, this obstacle would be a ‘high score challenge’ and would force the video-character to do a blind-folded, triple back flip off of a can of tomato soup over a pit of crocodiles and onto the ridge of a massive stone wall. In mountaineering terms, the Yellow Tower presents an equally formidable challenge – minus the crocodiles, soup, and backflip but adding into the equation a jumar and a 10,000 foot drop off of a slabby ledge no wider than a patio paving stone. To make a rather long story short, I was the first to rather ungracefully jumar way up the wall, trying desperately neither to think about the wind whistling behind me nor the aquamarine-blue glacial lake glittering in the sun several thousand feet below the backs of my big-booted heels. Thank god style-points were not handed out for the ascent of the Yellow Tower as, apart from my right leg doing the ‘jail-house rock’ with sheer terror, I would have received a negative score upon reaching the belay ledge where Chad stood smiling broadly and framed by an assortment of colorful ropes – old and new. I don’t think I’ve ever been more relieved to see him!! Valdis and Sergey followed closely and heroically behind (with significantly higher style points) and we recomposed ourselves in Camp Two. 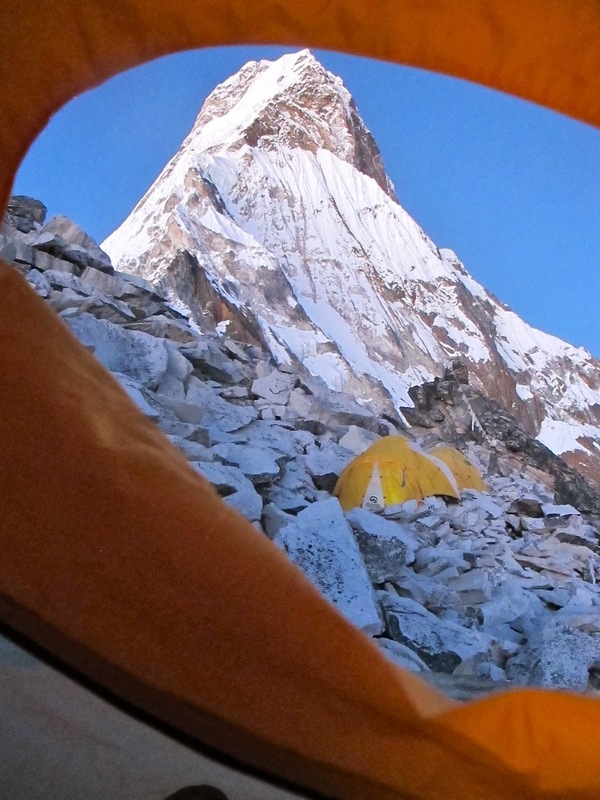 Camp Two is better known as ‘Camp Poo’ due to the extensive garbage and human waste left behind from other expeditions. It’s both sad and strange to see firsthand how one of the most iconic camps in the Himalaya is one of the dirtiest (serious understatement) I’ve ever seen… Needless to say, we were under strict instructions ‘not to touch anything’ and kept bottles of hand-sanitizer close to hand..! Having survived the Yellow Tower I was not eager to test my luck or the strength of my gastro-intestinal system here!! At Camp 2, we were also met by our super strong, skilled and smiling Sherpa team - Dorji Sonam Galgyen Sherpa, Palden Namgya Sherpa, Danuru Sherpa - who had come down from establishing our Camp 2.7. For the past few years Alpenglow Expeditions uses Camp 2. 7 as it’s a safer option (and only about 10 minutes away) from the more serac-prone and therefore dangerous Camp 3. Camp 2.7 was also to be the ‘launch pad’ for our summit push very early the following morning. I must admit, having escaped relatively unscathed from Camp Poo, and now standing in the shadow of the Grey Tower I was looking forward to this next section being over and having the opportunity to dive into my tent! Little did I know about the vertical adventures in store! Straight out of Camp 2 we made our way up a steep snow ridge, climbed through the Grey Tower… aptly named because it’s grey and it’s a tower (our minds are simple at altitude). I love mixed climbing and, being acclimatized (thanks to the physiological benefits gained through our 7000m ‘touch’ on Makalu) I found the Grey Tower to be quite a treat (ok, perhaps a slight exaggeration… a new pair of Jimmy Choo’s or a bed… or even a shower for that matter would have been a greater treat…). The Grey Tower is infamous for its unbiased affinity for shooting rock and ice missiles on climbers daring attempt its vertical face. Having said that, today the Tower was kind to us and few projectiles came down - the ice and snow lodged in numerous rock seams combined with some solid-rock steps carefully navigated through crampon-points provided great foot-holds and the only casualty of the climb was the granola bar that fell out of my pocket into the airy abyss thousands of meters below. Rocky outcrops also provided great handholds and, when combined with some careful jumaring, the 1.5 hour section proved to be a technical but thoroughly enjoyable vertical journey with conditions and terrain not dissimilar to what I’ve experienced on climbs both in Chamonix and in Scotland. The anchors and ropes were also good which provided some comfort although I did chuckle nervously at several points when I was provided with a choice of about 9 ropes all haphazardly poking their way out of the ice-covered rock… Russian roulette alpine style. Fortunately the ‘new rope’ was pretty obvious! We made good time climbing a snow-rock-ice chute off of the Grey Tower to gain the ridge traverse, better known as the infamous "Mushroom-Ridge". Mushroom Ridge can only be described as a very bizarre but fairly stable rock formation with ice and snow cornices tenuously stuck to a knife-edge ridge. The Ridge is famous – or rather, infamous - for no other reason than that it has been known to be white-knuckle-inducing heart-stopping-ly terrifying…. For approximately 1 kilometer one must walk along the rocky, icy, snowy ridge no more than 30cm wide with an abyss of thousands of feet falling away at either side. I’d heard and read horror stories about the ridge but again, found it in excellent condition - not quite to the point where one could do kartwheels on it - but it did offer occasional-enough solid snow / ice and rock footing (straddling, crawling, tip-toeing, inching…) With the help of a Palden Namgya Sherpa, and doing everything in my power not to look down I found my balance on the ridge and made my way across. The final stretch…!! We followed the ridge to the right side of the base of the Dablam, where I looked up - overjoyed, relieved, a little bit emotional (yes, I shed a single, frozen tear or two… or ten…) - to see Camp 2.7 beautifully carved into a giant ice buttress and sat on a narrow ledge no wider than a single tent. Sergey, Valdiz and Chad were already there waving comfortably from their tents and boiling water from snow. It was great to see that we’d all made it, unscathed, were in fine form and ready for an ‘exciting’ high-altitude evening of boiling water and discussing the nutritional benefits of freeze-dried food and other very educational, stimulating conversations which filled our hypoxic brains with wonder. Whilst it was only about 3.30pm, it felt like it had been a very long day with both mental and physical challenges that had really pushed my limits. Having said that, the day had made me realize a great deal about myself. Sitting in the tent on the narrow ledge, re-hydrating, recounting and laughing over the events of the day made me realize and reflect upon how far I’ve come in mountaineering terms over the past few years… From having an absolute, white-knuckle fear of heights (we’re talking in-door, household ladders!) several years ago through to today where I consistently entrusted my life to two tiny stainless-steel fork-like front-points with a 10,000 foot drop at my back and now sleeping in a tent on a ledge no wider than a tub protected by ropes no wider than a shoe-lace attached to a tempramental icy buttress… Has this been ‘development’, is my brain severely suffering from sustained lack of oxygen or am I just becoming ‘mad’ in my old age?! Either way, it’s soooooo worth it..! In spite of the fact that comfort was hard to come by and a good nights sleep eluded me, 4am rolled around far too quickly. From within the warm depths of my sleeping bag I‘d already anticipated the typical summit day early start. By the time I heard the Sherpa’s stirring in the neighboring tent, I’d already started to go through the mental check-list of the things I’d need to do as part of the finely-tuned ‘sleeping-bag to summit’ journey. Hand-warmer taping, summit-sock fitting, down layering, water boiling, backpack stocking, head-torch adjusting, helmet donning, crampon fitting, mitten tightening…. (I’m sooooo ‘low maintenance!). I’d been pre-warned that it was going to be bitterly cold so was doing absolutely everything in my power from our 6300m perch to do what I could to prepare for the baltic vertical journey that lay ahead. For once in my life, I was more concerned about doing everything I could to resemble the Michelin Man rather than a fashionista… a diva in down. We inched our way out of the tents, clipped on our safety and geared up our jumars and left the relative comforts of Camp 2.7 shortly after 5am – everyone was super psyched and raring to go. In spite of my nerves, I was happy and warm and excited to climb!! I knew what lay ahead was a relatively straight-forward steep and dramatic climb to the summit of one of the most beautiful mountains in the world. And it was well within our reach! It was time to put in some work and take advantage of all of the work that we’d been doing to prepare for this iconic and unforgettable climb. We started out of Camp 2.7 with two easy pitches of dramatic but very solid 40+ degree snow-ice to the side of the Dablam – a section which can be prone to some ice-fall. The sun had not yet hit the mountain so we climbed in the shadow and under a light breeze. Conditions were far from tropical – but they were certainly not bordering on arctic… and we did our best to move efficiently in temperatures bordering on -20 degrees. Adrian and Sergey led from the front with their usual efficient speed and skill whilst Valdis held up the middle and Chad and I formed the end of our vertical conga-line. We had the route to ourselves and again, found it in perfect condition with deep, solid snow-steps leading us to the 6800m summit. The trick was to find a rhythm and keep moving. Apart from a few stops to warm hands and take a drink I managed to do this under the watchful eyes of both Chad and Sherpa Dan Nuru. Rounding past the Dablam, we followed the fluted but very easy and solid, 30-48 degree snowfields over one rocky-outcrop that ultimately led to the summit of Ama Dablam. Whilst I was relatively acclimatized, this did not stop me from feeling the altitude and the cold. With Chad and the Sherpa Dan Nuru offering both encouragement and support, I managed to slowly (and perhaps rather ungracefully!) amble my way to the summit just as the sun hit. As I neared the top, Adrian, Sergey and Valdis had started to make their way down. I wish that I could say I summited with an air of dignity and strength and power however I must admit that I could do little but fall to my knees as I came over the crest of the final slope and onto the flat summit. And there I sat for a minute as a wave of emotion came over me – happiness, wonder, achievement, and gratefulness to have had the opportunity to climb this mountain with the support and encouragement of such a fabulous team…. Rather than go through the play-by-play of our tedious (but speedy!) descent from the summit I’ll summarise by saying that it went without a hitch and was (surprisingly) much easier than I thought it would be. Even the Mushroom Ridge seemed to pass without drama and I descended the Yellow Tower with significantly more grace (and speed) than ascent..! We reached Camp 1 in record-time and decided to make the most of the creature comforts (Tashi’s fabulous cooking and a bottle of whiskey) in Base Camp. On behalf of the Makalu-Ama Dablam summit-team, I’d like to extend a huge, huge thank you to everyone who has been following along and for supporting us during these past 2 months. It’s been an adventure of epic proportions and the fabulous memories will remain for many years to come. See you in the Fall 2013!! !